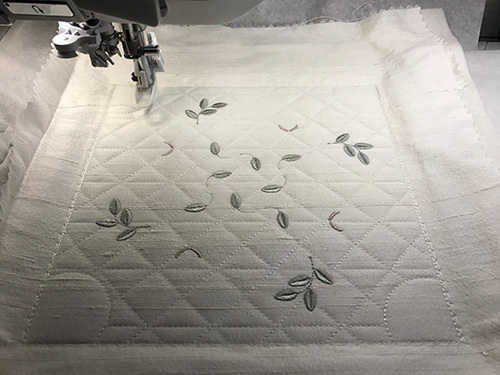 Today I embroidered out one of the more simple blocks from Beatrice Quilt blocks 2. 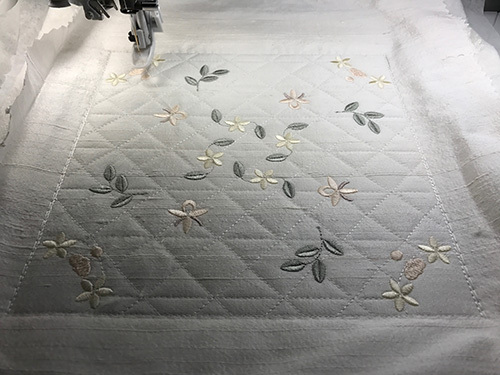 I wanted to check how this particular design looked with a large quilted background similar to one I had used in one of the Celtic Ivy blocks. 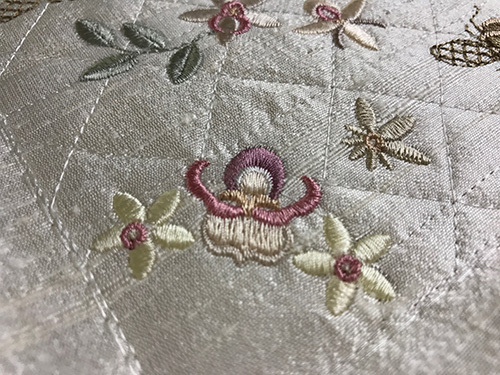 I used Schmetz Gold embroidery needles, 75/11 and Tire Silk #50 threads. 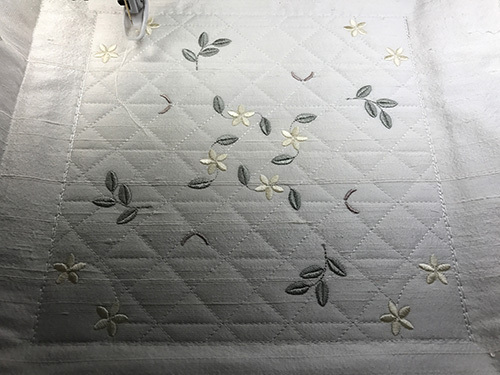 First of all I hooped up some Stitch and Tear in my 8″ square hoop, then applied my Floriani Embroidery batting to that with temporary adhesive spray (never use this near your machine, computers or devices)……. 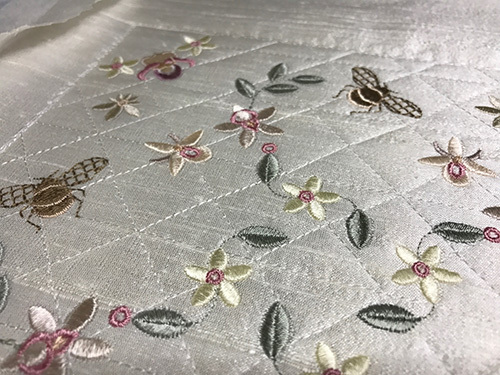 I decided on using some slubby ivory silk dupion which is one of my favourite silks, as it does not crease like the more smooth ones. Follow my progress with these snap shots after each colour was added. 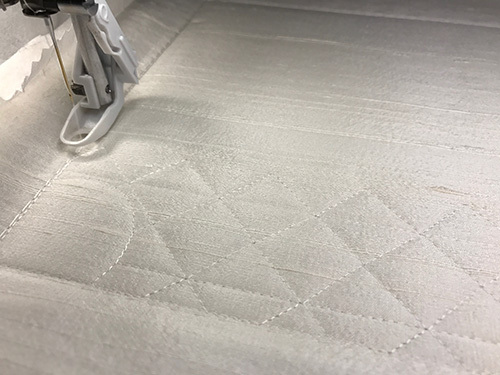 I think it best to match the thread for this quilting with your fabric. Just a hint of oyster for the back of one of the orchids. Adding the pale yellow blossoms. A little more colour with some a light peach. At this point I had a birds nest develop during the stitch out in the front left corner. 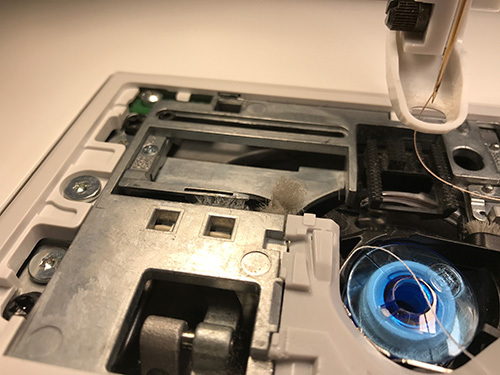 Yet I don’t think that was the silk thread that caused this, as when I checked my bobbin area there were quite a few threads needing to be removed. I do find my Husqvarna Epic machine collects more debris like this in the cutting area more frequently than my other machines did. I carefully removed the hoop by cutting underneath. There was a little damage done to the back of the design but I was able to unpick the stitches, trimming them first on the back, and the removing them with tweezers. 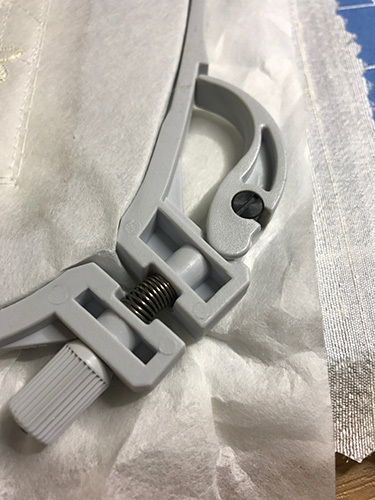 The underneath did not need repairing but if it had, I would have cut a square of stitch and tear, sprayed that with temporary adhesive and placed it underneath to support the damaged area, gently making sure it was well adhered. The last task was to address the pull out which always happens with a birds nest. I undid the hoop screw very slightly and pulled each side of the corner where the pull out occurred. The other three corners were still tight but I hardly moved the stitch and tear. 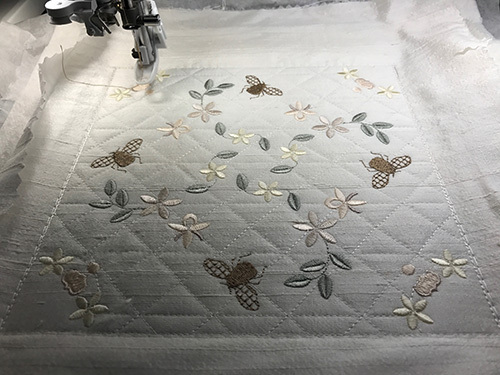 Best to do this very gradually as you do not want to dislodge the embroidery. When I returned the hoop to my machine I checked the alignment and it was off, so I removed the hoop and calibrated the machine. After calibrating I loaded the design again and attached the hoop. 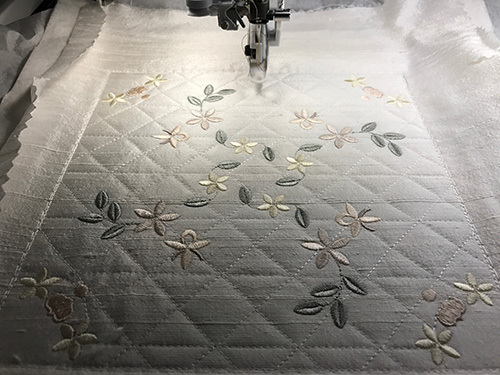 It is always prudent to save any editing you do to your designs before stitch out so that if you have to turn off the machine, everything is perfect when you load the design. I checked my alignment by moving to the place where the bird nest happened, zoomed in on the screen and selected a relevant stitch that had already been embroidered. I lowered the needle to see that it was accurate and it was. After lifting the needle I moved the design on to where I wanted the embroidery to start again, and pressed “start”. Back to the stitch out to see the result. More gorgeous colours to the bee orchids at each corner. 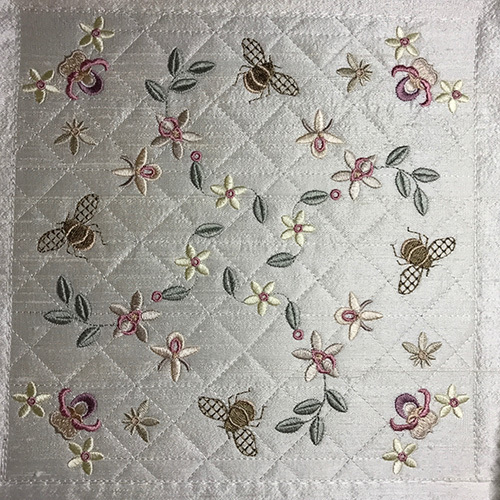 The quilt block is now finished. 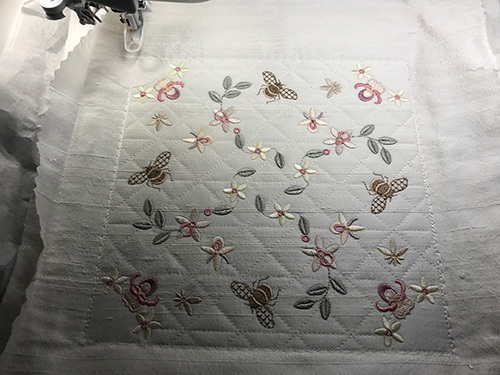 The remainder of the design stitched out reasonably well, although I noticed a little misalignment as can be seen in the pale yellow flower on the left. Never panic with birds nests as we all get them from time to time, and the process of recovering from them can be very satisfying! 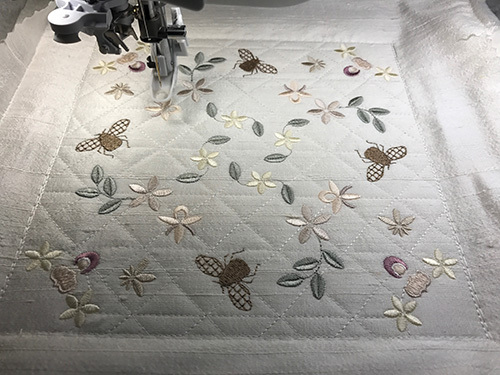 Like unpicking small errors in your embroidery, such as when you inadvertently thread the wrong colour, practise makes perfect, and even if the design is not saved you probably have learnt some important lessons in the process. 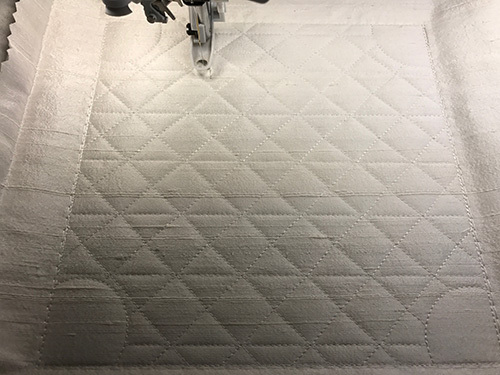 There are 10 Beatrice Quilt blocks along with a frame design to enlarge them to 260mm blocks. I hope I have whetted your appetite for these pretty designs. Enjoy! 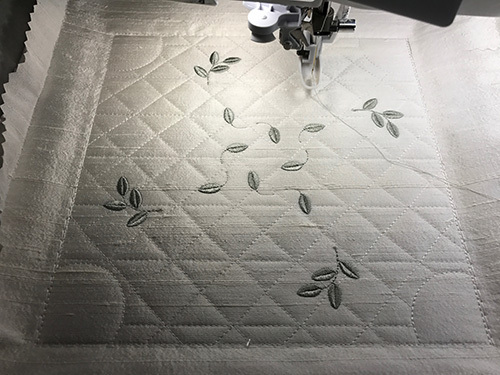 This entry was posted in Discussing machine embroidery and tagged birds nests, embroidery on silk, quilt blocks, silk embroidery thread, Solving stitch out problems. Bookmark the permalink. That is so very beautiful, and unless you confessed, nobody would know that there was ever a problem ! Very skillful work, Hazel. You should be very proud of it. Yes our mistakes are much more obvious to us. You could call them extra special features! Oh I love this!! So pretty!! I can imagine that within a quilt….WOW! !